SMesh is a seamless wireless mesh network being developed by the Distributed System and Networks Lab at Johns Hopkins University. It provides peer-to-peer connectivity, Internet connectivity, and fast handoff to mobile clients across the mesh. 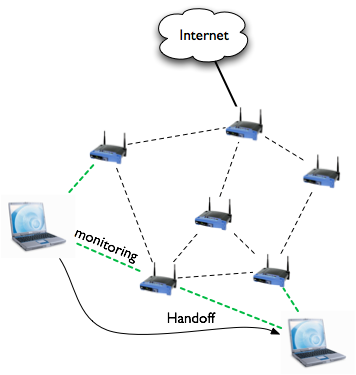 Clients get connected automatically through standard DHCP. No software or drivers need to be installed on the mobile devices. SMesh takes care of providing end-to-end connectivity transparently for the clients. SMesh operates in regular 802.11 IBSS mode. Its hierarchical architecture separates the mobile clients from the infrastructure. Clients send and receive data through the infrastructure and do not rely on other clients to forward their packets. This separation allows for transparent and efficient protocols to be deployed without any modification of the standard mobile devices. SMesh underlying communication infrastructure is built on a customized version of Spines, a messaging system that provides multi-hop communication between the wireless mesh nodes through a transparent socket API. SMesh is used to conduct research on real wireless deployments, and also serves as a distributed wireless access point for DSN lab members (and anyone else upon request). It is currently deployed on 14 nodes across several floors of the New Engineering Building, Shaffer Hall, and Maryland Building at Hopkins. The access point software runs on Linux boxes, including the widely available Linksys WRT54-G/GL/GS router. Tested mobile clients on our deployment include unmodified Windows XP, Mac OS-X, Windows-Mobile, Palm OS and Linux. SMesh was created by Yair Amir, Claudiu Danilov, Raluca Musaloiu-Elefteri, and Nilo Rivera, and is currently developed at the Distributed Systems and Networks Lab at Johns Hopkins University. Accepted to ACM Transactions of Computer Systems (ACM TOCS). In Proceedings of 2007 International Symposium on a World of Wireless, Mobile and Multimedia Networks (Helsinki, Finland, June 18 - 21, 2007). WoWMoM '07. IEEE, 1-10. In Proceedings of the 4th international Conference on Mobile Systems, Applications and Services (Uppsala, Sweden, June 19 - 22, 2006). MobiSys '06. ACM, New York, NY, 83-95.